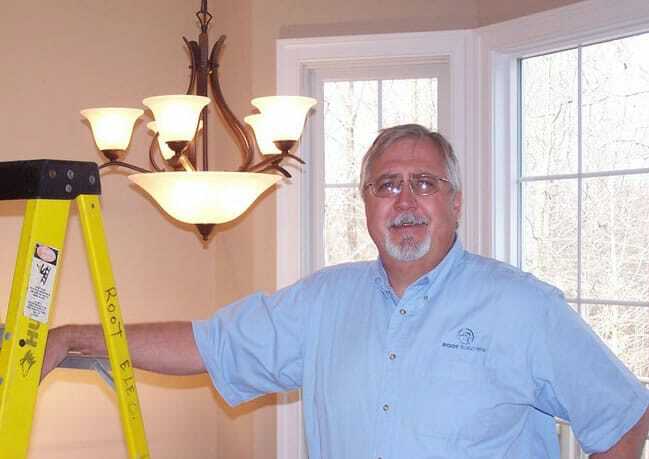 Here at Root Electric, one of our specialties is helping homeowners with lighting fixture replacement and repair. Aside from being experienced, licensed and insured Northern Virginia electricians, we have an eye for lighting design that can brighten and enhance a home’s interior or exterior spaces. Many older homes could especially benefit from a lighting update. Replacing heavy, old bright brass fixtures, or cheap, builder-grade light fixtures with new, high-quality, energy-saving, design-minded light fixtures is also a relatively inexpensive way to give a home a facelift while cutting your energy bills at the same time. So if you are considering a lighting fixture replacement project, consider the following first, and then give us a call with any questions you have. If you plan to do a general light fixture replacement project around your whole house, start with the outside first. This is a relatively simple way to enhance your home’s curb appeal. Starting outside also gives you the option of considering security lighting around the exterior of your home, which can also boost its value. When replacing light fixtures indoors, replace the fixtures in the highest traffic areas first: start in the entry way or foyer, then move into the kitchen and family room. After the areas with the highest traffic are well lit, replace light fixtures in the hallways, bathrooms and bedrooms. Consider energy efficiency when doing a lighting fixture replacement project. Not only do homeowners have a wide range of light bulb options, the fixtures themselves can affect how light is cast and reflected around a room so that less energy is used to effectively brighten more spaces. Put the lights in your home to best use: balance form and function when making light fixture choices. Recessed lighting, for example, can be used as general lighting, subject lighting (to highlight a particular work of art or feature in a room), or as task lighting in a kitchen or workshop. These guys are great. They installed recessed lighting in my living room and two new ceiling fans from scratch in the bedrooms. Highly recommend them, they do great work and amazing customer service. If you would like to replace old light fixtures in and around your home, call our Northern Virginia electricians for both technical and design advice. Sometimes light fixture replacement isn’t just a luxury; it is a safety necessity, particularly if you live in an older home with aluminum wiring, or if you have any other problems with the wiring in and around the light fixtures. In these cases, it is always best to get help from a professional electrician to avoid unfortunate, preventable accidents or fires. Some light fixtures may be hard to replace because they are in awkward locations in the house that may be difficult to reach without the right equipment. At Root Electric, we have all the tools, ladders and scaffolding that enable us to change light fixtures in even the tightest spots around the home. Safety first has always been our motto at Root Electric, and we have the expertise and equipment to ensure that your lighting fixture replacement project brightens up your home safely and beautifully. Call us today at (703) 494- 3989 for advice and assistance with your lighting project.